Learn about Kuala Lumpur by reading Indulge Yourself and Explore Malaysia – Kuala Lumpur by Sandy Zimmerman, Travel Writer. It features a mini, but thorough tour of the destination, plus all you'll need to know to plan your trip including getting there, objective information on places to stay and eat, and things to do. At the end of the article, we've provided a summary of the contact information for your easy reference. Enjoy! Malaysia is located at the crossroads of Southeast Asia, between the Indian Ocean and the South China Sea. You will enjoy the country’s multi-cultural character in their cuisine, architecture and people. Experience adventure in the jungles, unbelievable shopping bargains, an exciting variety of cuisines, historic sites, the delights of the capital, Kuala Lumpur and beyond to the smaller towns. 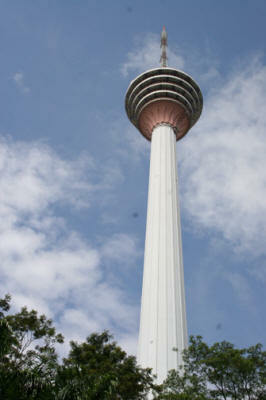 Standing 905 feet high, the Kuala Lumpur Tower, http://www.kiat.net/malaysia/KL/kltower.html, takes you up to the clouds! This concrete telecommunications Tower is the tallest in Asia and ranks fourth in the world. The elevator is fast, moving less than one second per floor. On the Observation Deck, we were given an audio tour guide. I stopped at a stunning display of two chairs covered with embroidered red silk, veiled by a silken canopy, surrounded by giant bouquets of flowers. It is the setting for a Malaysian wedding ceremony. Yes, you can arrange a traditional Malaysian wedding wearing some of the most ornate jeweled gowns. Or just wear the gowns for a photo opportunity. The Malaysian bride and groom look like a king and queen in their finery. At the top of the KL tower, it takes 90 minutes for the Restoran Berputar Seri Angkasa revolving restaurant to complete the circle. Downstairs in the lobby, the crystal dome ceiling took 6 months to complete by cutting and pasting the crystal from mirrors. Stop at the exhibit of gongs, drums, xylophones, and other ancient musical instruments in front of the Tower. The Eye on Malaysia ferris wheel is similar to the gondola lifts at mountain ski resorts. Enter one of the 42 enclosed, air-conditioned gondolas (including 1 VIP gondola) and experience a 360-degree panoramic view of Kuala Lumpur during the 12-15 minute ride that reaches 196 feet high. They even perform weddings during the ride! The Eye on Malaysia is the tallest portable observation ferris wheel in the world. Visitors can take the Petronas Twin Towers tour for breathtaking views of Kuala Lumpur. Take the double-decker elevators, which stop at two floors at the same time. Tickets are free but you have to pick them up at 8:30 am. The Berjaya Times Square Hotel & Conference Center, http://www.berjayahotels-resorts.com/ is modeled after New York’s Times Square with names like Big Apple Restaurant, Broadway Lounge, Manhattan Ballroom, Central Park, etc. Berjaya has a shopping complex which features 14 thrill rides in Asia’s largest indoor theme park, a supermarket, 900 stores, 2 and 3D movie experience at IMAX theatres, 9 Cineplex’s, a 56- lane bowling alley, plus 65 food and beverage outlets. Shopping, dining and entertainment all under one roof! You can even take the elevator up to catch the monorail. The hotel’s buffets range from Indian, Thai, International, and pizza to high tea. Berjaya is the only all suites hotel in Kuala Lumpur. Each suite includes a living room, bedroom, mini pantry, and bathroom. The Berjaya’s wedding planner arranges traditional Chinese, Malayan, Indian and Western weddings. You may wish to wear gowns from some of these weddings while using a Western setting. There is a food tasting session to assist you in deciding the menu. They have 10 meeting rooms and ballroom with a capacity for 2,000 people. And best of all, the exchange rate is favorable; staying at this beautiful five-star hotel is reasonable. The five-star luxury Grand Millennium Kuala Lumpur Hotel, http://www.millenniumhotels.com/my/millenniumkualalumpur/index.html is impressive starting from the outside and going throughout the entire hotel. The glittering gold leaf decorated lobby welcomes you with a chandelier hanging from 3 floors above you. The gold leaf infinity overflowing fountain is a place to sit and enjoy the atmosphere. They offer three restaurants, a nightclub and 15,000 square feet of meeting space. Their Motto: "You are the center of our world." Shopping Is an Adventure in Malaysia! The entrance to the Sunway Mega Shopping Mall is stunning. Imagine a shopping center filled with the five-star Sunway Lagoon Resort, Balinese-inspired Mandara Spa, four-star Pyramid Tower tourist hotel, the Sunway Lagoon theme park, an Exhibition and Convention Center, a medical center, a 48-lane mega lane bowling alley, indoor archery, an amusement center, the largest indoor ice skating rink, a 12-screen Cineplex, the Sunway University College, and Monash University. If you are hungry, choose from 41 restaurants, 18 cafes, 11 fast food outlets, 23 snack stops, and four ice cream parlors. The five shopping districts include Fashion Central, Oasis Boulevard, Asian Avenue, Kidz Zone and Marrakesh. Marrakesh is reminiscent of the exotic bazaars and Souks of Marrakech, Morocco. You walk on Persian rugs surrounded by Moorish decor. The 700 specialty outlets include accessories, shoes, jewelry, timepieces, music, videos, gifts, souvenirs, leathers, books, pharmacies, electrical products, home furnishing, wellness, and a one stop IT center. There is four million square feet of retail space. In addition to all of this, you can enjoy free live entertainment and events planned for shoppers. The convention center offers 100,000 square feet of function space along with indoor and outdoor choices. With an exchange rate of RM 3.2= $1. U.S. (December, 2007), the US$ goes further here. 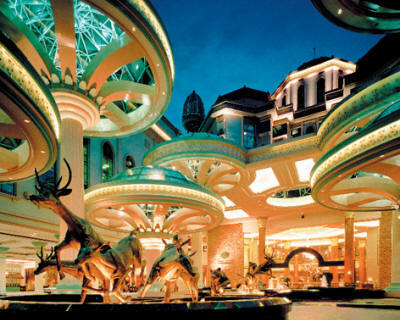 The largest mall in Malaysia and only theme mall in Asia is Sunway Pyramid, http://www.sunwaypyramid.com.my/. The Egyptian theme welcomes you as you approach the giant lion statue guarding the entrance. They call it a shopping kingdom! Other mega-malls include: the Mid-Valley Mega Mall, http://www.midvalleycity.com/, with 430 shops, entertainment, and dining and 1,000 hotel rooms. The Pavilion Mega Mall, http://www.pavilion-kl.com/, offers designer labels and the world’s famous brands. Malaysia Airlines flight attendants wear traditional Malaysian Batik outfits, the tight fitting, long sleeve blouse with a long ankle-length sarong-style skirt. Malaysia Airlines covers six continents and more than 36 local destinations nationally. 800-648-3273, http://www.malaysiaairlines.com/my/en.html. Tourism Malaysia contact information, 213-689-9702 and 212-754-1113, http://www.tourismmalaysia.gov.my/, http://www.virtualmalaysia.com/. Visitors must have a valid passport or travel document with a minimum validity for 6 months following the intended visiting period. Most nationalities do not require visas for social or business visits. Notice: This information is current as of March 2008. It is recommended that you contact the numbers, and/or visit the websites above to determine any changes to the information.